Will Sager, University of Houston professor of geophysics, along with six Department of Earth and Atmospheric Sciences graduate students, spent 48 days on a research cruise aboard the R/V Nathaniel B. Palmer. Will Sager and students aboard the R/V Nathaniel B. Palmer. This research cruise, which departed from Montevideo, Uruguay, focused on characterizing the Rio Grande Rise, an undersea volcanic mountain range, by collecting bathymetry and magnetic data, and dredging up rock samples from the ocean floor. “Students got to see how field research is done and how to put together an expedition,” Sager said. In the south Atlantic, there are two major oceanic plateaus: the Rio Grande Rise and the Walvis Ridge. These two plateaus are thought to have formed at the Mid-Atlantic Ridge between 70 to 90 million years ago, then diverged as the South America and Africa plates pulled apart. 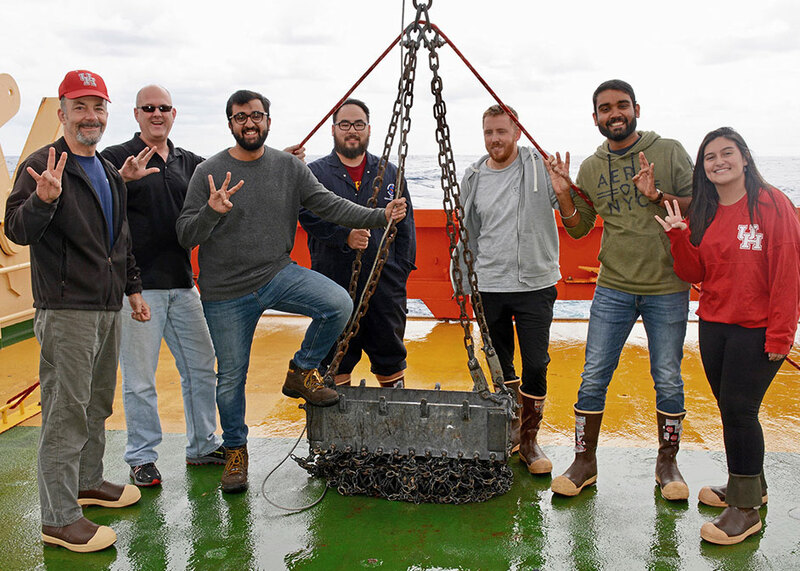 “This is a study of the evolution of oceanic plateaus in the South Atlantic,” said Harsha Thoram, a Ph.D. student in geophysics who went on the research cruise. The exact timing of plateau formation, as well as the mechanism, is still largely unknown, due to a lack of data. “We are trying to piece together the history of the Rio Grande Rise and the Walvis Ridge,” Sager said. The prevailing theory is the two largest parts of these mountain ranges formed together at the Mid-Atlantic Ridge and split as the plates pulled apart. But, as with many things, the truth may be a little more complicated, with ridge formation also resulting from additional types of volcanic activity. “It's a little bit like some jigsaw puzzles got mixed up, and we are trying to figure out which pieces go in which places,” Sager said. On this cruise, Sager and students collected various types of data to fill in the missing pieces about Rio Grande Rise. This included bathymetry data, magnetic data and rock collection. Similar to topography, bathymetry is the study of the underwater depth of ocean floors. Magnetic data offers insight into when the seafloor was formed. Researchers also dredged rocks, dragging a basket along the ocean floor, bringing up samples. Analysis of these samples will show the composition of the ocean floor, as well as offer a timeline for when and how these rocks were formed. The R/V Nathaniel B. Palmer is chartered by the National Science Foundation. Additional travel support was provided by UH Learning Abroad and the College of Natural Sciences and Mathematics.